A vital petrol station on Skye has reopened following a £3.5million overhaul. 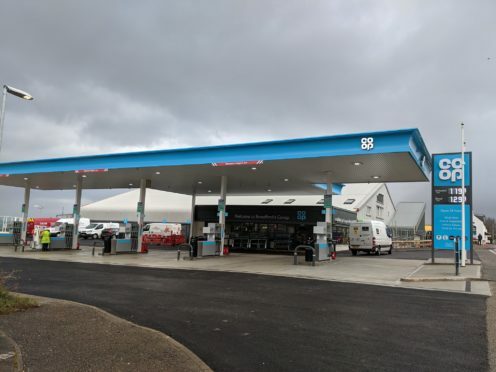 The Co-op store in Broadford reopened yesterday following a significant investment programme, including expanding the size of the fuel courtyard and installing brand new fuel tanks. At the same time, the store has been fully refurbished, with the adjoining car park resurfaced after being hampered by potholes and cracks in the road for some time. Work on the project has taken six months to complete, with a temporary diesel fuel delivery system put in place throughout the majority of works. The closure of the fuel facility sparked controversy as prior to its closure it served as the only 24-hour petrol station on the island. Compromise was met after local groups spoke out against a potential fuel halt and the potential consequences it could have to visitors on the island should all fuel provisions at the facility be seized. Daniel Simpson, area manager for Co-op, said: “We would like to thank the community for their understanding and patience during the refit, but we think they will agree that it has been worth the wait. Other businesses in the vicinity have taken advantage of the swells of fuel seekers visiting their establishments, with the Kyle Filling Station installing 24-hour payment facilities to allow passing trade to ensure adequate fuel supply was sought prior to their journeys to and from the Misty Isle. Hamish Fraser, chairman of the Broadford and Strath Community Council, said: “The overall refurbishment of the Co-op store and fuel forecourt in Broadford has been carried out in a most satisfactory and professional manner, and has brought new life to an important facility in the centre of the village. “The project team, the construction team and Co-op staff, who enabled an unbroken and ongoing service provision to the community during the renovations, are to be highly commended. He added: “The ethos of cooperation and information sharing throughout the whole refurbishment – which is being delivered within the time scales projected – has been important to the community this store serves and we thank all concerned for that.